For years, plenty of them, my younger girls have been asking when I was going to make their scrapbooks. 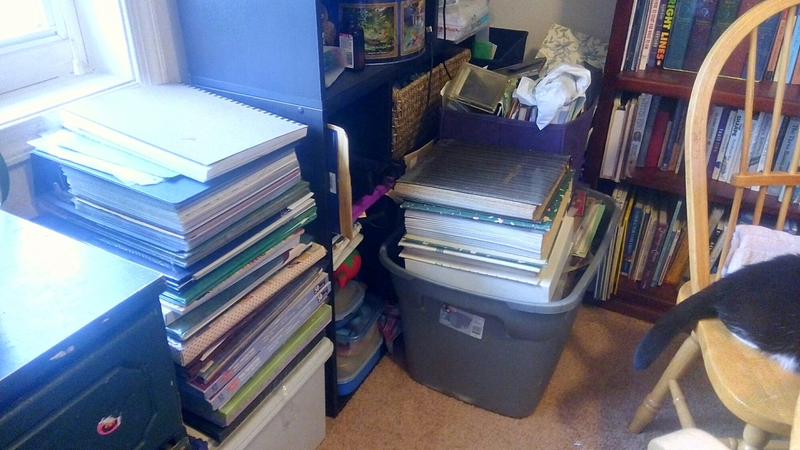 And my older kids have been asking when was I going to finish their scrapbooks. I finally have an answer: 2016. This pile (plus two more bins tucked into a closet) is roughly 30 years worth of memorabilia, minus the 5-6 years in the middle which I’ve completed. Oh, and I quit developing pictures when digital got big, so there will be more. Here’s the rub: I haven’t had a dedicated scrapping space since I left Topeka in 2000. I made one today. I’m not sure the children will be entirely happy with me, because I claimed the dining room table to make this happen. And I have to be able to leave things on it. Scrapping isn’t something I can do in 10 minutes and clean up and take back out for 10 minutes again later. I need the pictures, the papers, the books, the mats, the tape runner, the page protectors, the pens, the, the, the literally at my fingertips. So. We’ll be eating our meals Japanese style, seated on the floor around a coffee table in front of the glass wall to the balcony for the duration. Not a great solution, but a solution. I want to get these stories down before I get dementia. My memory is sketchy enough as it is. In other news, I cleaned the living room today. I have a guest coming this weekend. I’ve promised to spend next Tuesday with my daughter. I can tackle the bathrooms and kitchen next Thursday. Then Marscon the next weekend. That means I can start scrapping on the 18th (if I’m off for the holiday and I am pretty sure I am) or the 19th. The first thing I have to do is look at all this stuff and see what I actually have. It’s been moved and removed so many times that all I have now is a great big jumbled up mess of memories. This entry was posted on January 7, 2016, in cass has goals, cass plans, cass talks about herself. Bookmark the permalink.